For over 80 years Bert Hoffman has worked in a variety of capacities as a student, soldier, engineer, teacher, and coach. Each position that Hoffman took offered him a different set of challenges and a completely different set of rewards. "What you do is important. How you do it is more important. Why you do it is most important," said Hoffman. Growing up in St. Timothy's parish, on Chicago's North Side during The Great Depression, Hoffman learned the power of giving. Out of his allowance ($.10 per week), Hoffman donated 10% to the collection at church each week. Hoffman's experiences during this time helped to shape his outlook on life, and his memory and recollection of details from this period is amazing. Hoffman clearly recalls his first trip to Wrigley Field. It was 70 years ago, and he can still recite the entire Cub's lineup from that game in 1938. Hoffman feels blessed to have accumulated a good deal of wealth in his life and feels obliged to do the right thing with his wealth. "Somehow the Lord allowed me to make money, over three million dollars. God destined me to make money, and I've tried to do with it what He would do," said Hoffman. To that end, Hoffman has funded a total of 27 endowments at various institutions. 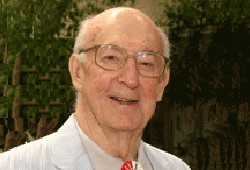 He funded a $100,000 endowment at Saint Patrick in memory of his brother Fr. John C. Hoffman, S.J., a Jesuit Priest, on June 8, 1999. Giving is its own reward for Hoffman. "The more you give away, the more you get back. This is true for love and intelligence as well as money." Hoffman attended Loyola Academy when the campus was still located at Devon and Sheridan, and he studied at Loyola University for two years before going on to Illinois Institute of Technology, where he was awarded a Bachelor of Science degree in Civil Engineering. He then moved to California, serving as a teaching assistant while earning his Master of Science degree in Civil Engineering from the University of California-Berkeley. Hoffman was drafted into the United States Army in 1952, and he helped to reconstruct Japan after World War II as part of the Army Corps of Engineers. Following his discharge in 1954, Hoffman worked for a decade in the engineering field, where he was involved in some high profile projects. Most notably, he was one of three structural engineers charged with designing the Chicago Skyway Bridge. Hoffman went back to school, earning a Master of Science degree in Business Administration from St. Louis University. In 1964 Hoffman took a job in sales engineering for the Chicago office of Bethlehem Steel. He would work for Bethlehem Steel for the next 20 years. After Hoffman left Bethlehem Steel, a friend who taught and coached at Gordon Tech contacted him to see if he was interested in working at Gordon. Hoffman accepted the offer, teaching religion and coaching at Gordon from 1984 to 1990. Hoffman started the volleyball program for the Rams, and he served as Head Coach of the team. Following his time at Gordon, Hoffman coached volleyball at Loyola and Resurrection for seven more years. Over the last decade, Hoffman has become more introspective. Hoffman has written four books, and he is currently working on his fifth. His first two books, Letters to Paul and More Letters to Paul told Hoffman's life story through letters to his brother's youngest son, Paul. His third book, United States History Letters to Paul is a brief summary of the history of the United States from colonial times to 1960. Hoffman has come to the conclusion that life can be simple, "I believe that it all boils down to a battle between good and evil. Human nature is the same. The Lord lets human beings get into and out of things in their lives," said Hoffman.